Please see the chart above for the contribution amount limits applicable for 2011-2012. The inflation adjustments to these limits are made only in odd-numbered years. 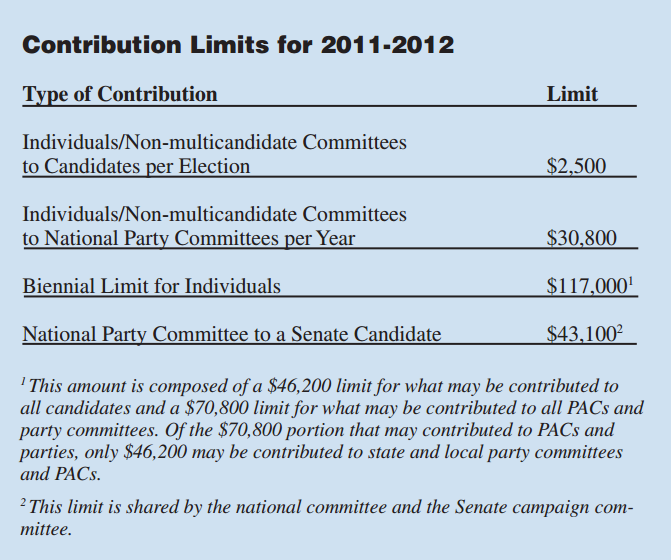 The per-election limits on contributions to candidates are in effect for the two-year election cycle beginning the day after the general election and ending on the date of the next general election (i.e., November 3, 2010 – November 6, 2012). All other contribution limits are in effect for the two-calendar-year period beginning on January 1 of the odd-numbered year and ending on December 31 of the even-numbered year (i.e., January 1, 2011 – December 31, 2012). The Act also includes a rounding provision for all of the amounts that are increased by the indexing for inflation. [FN2] Under this provision, if the inflation-adjusted amount is not a multiple of $100, then the amount is rounded to the nearest $100. 2 This provision also affects the indexing of coordinated party expenditure limits and presidential expenditure limits in 2 U.S.C. §§ 441a(b) and 441a(d), as well as the disclosure threshold for lobbyist bundled contributions in 2 U.S.C. § 434(i)(3)(A).